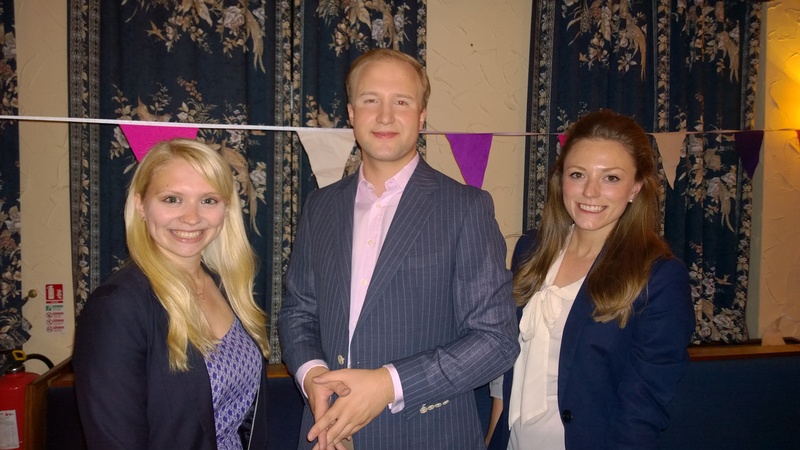 We were delighted to welcome etiquette expert William Hanson to our October meeting. He is well known as the resident etiquette expert on Radio 2 and has written for a huge range of publications including magazines and newspapers. The evening began with a talk by William, who covered everything from how to greet people in the right way (only one kiss) to how to curtsy for the Queen. Every instruction was given with an amusing anecdote or comment, putting everyone at ease. William Hanson with Spa Sweethearts president Becky Warburton and committee member Rebecca Drew, who booked him to speak to us. Once we had been given all the information we needed, our hostesses served a delicious array of cakes supplied by the committee. William spent some time visiting all of the tables and answering questions about everything from giving gifts to using the facilities (always loo or lavatory; never the T word). The evening was a real hit with everyone present, including some very welcome guests from Rufforth WI. The only thing lacking was instructions for how to discuss someone in their absence, or indeed write about them, so I have no doubt committed a dreadful sin by constantly using William’s first name here. I can only apologise for undoing all his good work. However, as he said, the main thing about etiquette and good manners is to make people feel as comfortable as possible, so here’s hoping I’m forgiven. The next meeting will be Sushi, led by York Cookery School. This is a change to our programme due to our previous speaker pulling out, but we are expecting an excellent evening with some practical experience of sushi-making.